I am the guest speaker tonight at the Camrose Quilt Guild. My topic is all about scrap quilts. How I sort and store my scraps. How I use the scraps and the scrap quilts that I make. 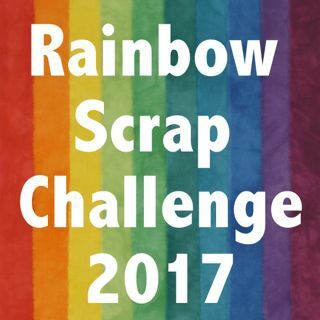 I will be showing many other Rainbow scrap quilts. Here are the strings I needed to make the quilt below. Most are 1 1/2" strips but some are not that size, it was OK if it was short or just a bit larger. The lengthen of the strips are around 5 or 6" long. It was used for the outer boarder. And the finished quilt. I got the pattern you can see the pattern I bought Here. I made a few changes so I did not follow it to a tea. I am also teaching a class for them in early November. I am so excited to be doing some more teaching and speaking. I have asked my mom, Betty, to come with me tonight, she got me started in the hobby of quilting. KFC is Kaffe Fassett Collection of fabric. Kaffe has a team with a few designers. He then helps pick the colours that will be used in the fabrics.